The Mars rover Curiosity is pretty much comparable to the size of a Mini Cooper. 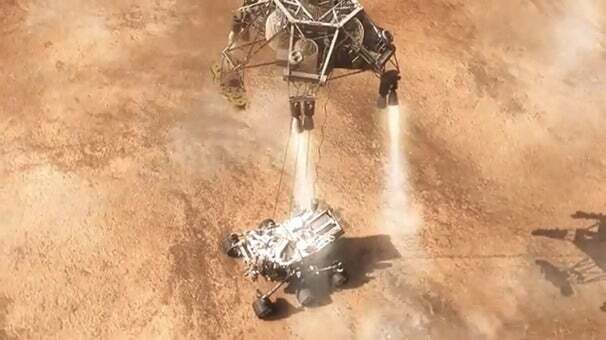 The rover’s massive size not only creates a new set of problems for powering it, but also for safely landing it. The NASA Jet Propulsion Laboratory released this latest, overly dramatic video that highlights the challenges of landing the car-sized Curiosity on the Martian landscape this coming August. In short, Curiosity will have to slow itself down from hurdling though space at 13,000 miles per hour to zero in the span of just seven minutes. If everything goes as planned, Curiosity's space capsule will first hit the Martian atmosphere horizontally, sort of like a plane flying though the sky. Once the capsule passes though the atmosphere and slows to approximately 1,000mph, it will deploy a 51-foot-wide parachute and jettison its heat shield. Even with the parachute, the rover will still be descending at a rate of 200mph, so the rover module will detach from the remaining capsule and ride the rest of the way down on rocket motors. These rockets will also carry the module to its landing zone, cut off its horizontal velocity, and prepare it for a gentle vertical landing. The module won’t land on the ground as a whole unit like a Harrier jet. Instead, it'll detach from the rocket platform while lowering itself to the ground using a set of cables in a sky-crane maneuver. The craziest thing is that this entire process will take just seven minutes to complete. But the worst thing is that it takes 14 minutes for Curiosity to send a signal back to Earth, so NASA scientists won't know right away whether Curiosity safely landed safely or created a very expensive crater.